Which comes first the bicycle or the bike speaker? I used to be a huge fan of cycling. 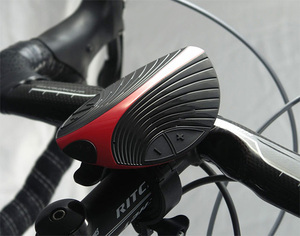 Now, after nearly 2 bikeless years, a cool new gadget put me back in the bicycle seat again. The Cy-Fi wireless sports speaker was created for cyclists who love to listen to music when they hit the road, but know that riding with headphones or earbuds is an accident (or ticket, in some states) waiting to happen. Listen in (or read on) as I discuss the pros and cons of this innovative sports speaker. The music capabilities alone appealed. But, the Cy-Fi also synchs to any Bluetooth enabled phone, PDA, MP3 player or laptop, turning the sporty little speaker into a wireless 4-oz traveling sound system. THAT, I love. Attahcing the Cy-Fi to the bike handlebar using the provided mounting bracket is a no-brainer; no tools required. And, the controls are just as easy. I love tooling around town and the bike trails spinning to the beat of my favorite playlists. The sound is great and if you’re trolling for a date, the Cy-Fi attracts as much attention as a chocolate lab puppy. Especially if you’re using the Cy-Fi’s speakerphone feature. Once people figure out your not a lunatic riding around talking to yourself, they want details. How’s it work. Where do you get one? People stopped me on the street wanting to learn more. I have a lot of fun with that. Favorite Feature: Portability, size and sound. In addition to streaming tunes while I ride, it’s also a fun way to pump up a picnic or impress em’ at the office by adding great audio to a laptop presentation. Not-so-favorite Feature: Caller complaints of an annoying echo and wind noise quickly disabused me of any hopes of conducting conference calls while pedaling off last night’s cheesecake. Darn! Bottom-line: For cyclers who want music AND a safe ride, Cy-Fi’s just the ticket. Available at www.mycyfi.com or at The Travel Store at EllenBarone.com powered by Amazon.